In the first iteration of G.T. 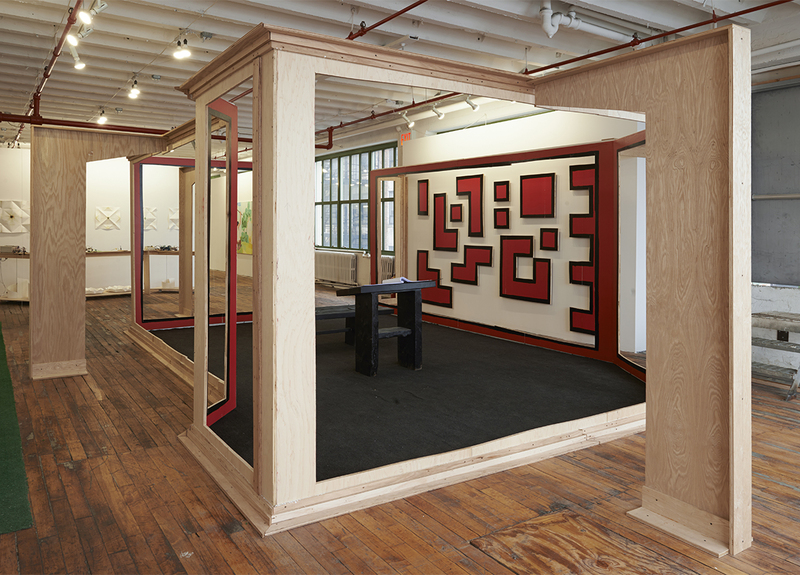 Pellizzi’s dynamic installation, The Red and the Black (2013), the artist exposed the often-invisible inner workings of the art world. The art world can be separated into three general spheres of influence: 1) the artist’s labor, without which art works themselves couldn’t come to fruition, 2) the art market, which can, when working in the artist’s favor, propel said works beyond their origins and provide the artist with the financial support needed to continue their work, and finally, 3) what we can call the academy, which provides the pedagogy or conversations that permeates both the artist studio and the gallery. G.T. Pellizzi, “The Red and the Black,” 2013. Plywood, oil paint, dimensions variable. Courtesy of the artist. Photo by Zack Garlitos. Pellizzi’s installation title is taken from the late 19th-century French novel, Le Rouge et le Noir, by Stendhal, where the protagonist must choose between the two dominant seemingly disparate social spheres of his time: the clergy and the army. Cleverly, Pellizzi draws a similar correlation between Stendhal’s proposed dilemma and the choices artists’ face today. Who or what are artists to pledge their allegiance —the market or the academy? To animate this dialogue, Pellizzi erected shiny walls, drenched in a brilliant shade of vermilion, reminiscent of the hue present on traditional Shinto temple torii gates. The walls act as a shell that hides the existing structure of the gallery space, creating a room within a room. After the artist completed the construction of the walls, he offered them up for sale at the going rate per square footage on the Lower East Side real estate market, where the exhibition occurred. The collector determined the slick black marks Pellizzi painted on the wall’s surface that divided each selected and sold plot. They were then required to disclose their identity on a ledger placed openly in the center of the installation. With this final step, the art process, from production to final sale, is played out to completion. The second iteration of The Red and the Black occurred at Come Together: Surviving Sandy, a show that celebrated the resilience and production of artists. Placed on the third floor of the exhibit, The Red and The Black appeared in a transformed state; the structure was now void. All of the sold pieces were cut away from the frame and what remained was a skeletal outline of the previously complete room. On one side of the transformed structure, we see untreated plywood, and on the other, small slivers of the formerly filled walls. Black carpeting covers the floor of the installation and at the center sits the podium and sales ledger. A small section of cut up pieces of the wall are hung recessed from the frame on the only white space near the installation. In this new context, placed amongst works from other artists, who despite economic and environmental disasters continue to find a way to produce, The Red and the Black, reminds us of what cannot be lost even after a hurricane, and that is the first sphere introduced above; the very will and the tenacity to produce and engage in the labor and discourse of art regardless of the many challenges that arise.